Self Harm Research – Can You Help? It is really important for us to understand more about self-harm and help in the future development of services for young people who self-harm. We are looking for young people aged 11-21 who have self-harmed in the last 6 months to take part in our research. The next Harmless adult drop (ages 18+) in is next Wednesday, 2nd July from 14:30-15:30. These sessions are for anyone who would like support for either themselves or others. Our trained therapists will be on hand to offer information or advice about any concerns you may have. Or, if you would like more information about the service is general and the work we do, feel free to come for a chat during these drop in sessions. Our drop in sessions are held at the Nottingham Community and Voluntary Centre on Mansfield road (opposite House of Fraser). Two drop in services are available on a bi-monthly basis. The next young persons drop in for ages 11-21 will take place on Wednesday 6th August at the new time 3pm. To find out further dates for the Harmless Drop ins, click here. A ‘toxic childhood’ of cyberbullying, social media and hypersexualised culture is leading one in five teenagers to self-harm, according to experts. According to a new study by the World Health Organisation, the number of teenagers in England who self-harm has trebled in the last 12 years. The Health Behaviour in School-Aged Children (HBSC) report, which is due to be published this autumn, revealed that 20 percent of the 15-year-olds questioned said they had harmed themselves within the last 12 months. When a similar study of self-harm in England was published by the British Medical Journal in 2002 it revealed that 6.9 percent of the 6,000 15 and 16-year-olds questioned said they had self-harmed in the previous year. Some experts have put the worrying trend down to pressures put on children who are increasingly living a higher proportion of their lives online, frequently using social networks which can put added pressed on youngsters. Children, especially girls, are also increasingly coming under pressure from cyberbullying, and an apparent heightening of sexualisation in childhood. Lucie Russell, director of campaigns at the Young Minds charity, told The Times: ‘Add that to bullying on and offline, the stresses of school and exams, uncertainly about their future and increasing sexual pressures, and it is a very bleak picture,’ she told newspaper. As part of the HBSC report, 6,000 children aged 11, 13, and 15 living in England were asked if they had self-harmed. The question was included in the study, carried out every four years, after a number of teachers reported seeing an increase in instances of self-harm, which encompasses actions such as cutting, burning and even biting. Professor Fiona Brooks, the head of adolescent and child health at the University of Hertfordshire, has been helping to put together the WHO report. She said that boys and girls aged 11 had displayed a good level of emotional wellbeing, but at 15 a gap had emerged between the sexes, with 45 per cent of girls reporting that they felt unhappy once a week. The same was true of 23 per cent of boys. She added that teenagers are ‘turning to strategies such as self-harm to manage stress in the short term’. News of the WHO study comes after government health advisers warned last week that overuse of the internet is causing mental health problems for children. The link becomes particularly striking when children spend more than four hours a day in front of a screen – but it kicks in even at very low levels of use, according to the report. The report also notes that the number of calls to ChildLine about online bullying, suicidal thoughts and self-harm have soared in recent years. On Saturday, representatives from The Tomorrow Project team attended the East Leake carnival and held a stall to promote our work. The day gave the local community an opportunity to find out information about our services and speak to our team about the project. We were really pleased to be part of such a wonderful day; for us, having the chance to meet people from the local area and raising awareness about the important role we have within East Leake and the surrounding area is an essential facet of our work. On the day, we also spoke to a representative of the local church who have kindly offered to advertise our work in their magazine. This will enable us to reach our further to individuals affected by self harm and suicide. We’d like to thank those organisers and and everyone who supported us. 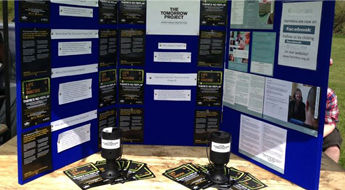 We raised over £100 which will go directly to supporting The Tomorrow Project in the local area. What will make you read me? For years now I have been wondering what it is that makes people stop and pay attention. What makes us read an article or a blog like this? What makes us stop and look at a poster in the street? What is it that makes us notice? Or alternatively- what makes us ignore- turn away from an act of violence in the street, ignore the scars on someone’s arms or the pain in their face? Because if I understand that well enough, surely i can use that to reach more people; I can use that to get you to read this blog and hopefully learn something. I write about self harm. I write about things we don’t want to even think about. So how on earth do I get people to engage with these issues, when they’re so ugly to contemplate? How then do I get you to read a blog about such things? or perhaps if I offer something helpful, or hopeful, or real? But what I am sure of, is that these issues are amongst us even if we don’t want to think about them or read about them. Not thinking about self harm, won’t make it go away. It won’t make the friend that we know is hurting themselves, stop. Nor will ignoring suicide make it less of a part of our reality. It’s awful, it really is. It’s shocking that suicide is the second biggest killer of our young people. But suicide happens. And it happens to real people just like you and I. It happens to people that are loved and have friends and families. It happens to people we know. So how do we learn to notice that someone’s struggling? How do we let ourselves listen when someone is trying to tell us that they need us. I think firstly, it’s important to let go of fear and of the fallacy that pretending it isn’t happening is a helpful thing to do. Or that it will make a difference. It won’t. Let yourself notice. Let yourself read, and think, and feel and hear. If you do all of these things, you might just be the one on the end of the phone when someone is struggling. That might be enough to help them to turn a corner. That can’t happen if you don’t notice. Noticing creates an opportunity to share. You don’t have to have the right words. You just have to be there. For people in distress, often it is knowing someone is there and cares that makes all the difference. You don’t need to be trained or qualification- you just need to be you. But for now, I don’t know if anyone will even read this! If you do, please share our blog, follow us on twitter, like us on Facebook and tell us your thoughts. Let’s together take tiny steps to reaching more people in their distress. On Thursday two representatives of The Tomorrow project and Harmless attended The National Suicide Prevention Alliance. We were invited to the 1st Annual Membership meeting at The Directory of Social Change in London. The day provided a great opportunity for networking, hearing about important developments within the NSPA and joint programmes of work and what this meant for The Tomorrow project and Harmless. 1 Build an active network of organisations that are committed to taking action to reduce suicide and better supporting those affected by suicide; creating a network of contacts, information and resources to facilitate collaboration between members, including coordinated action. 2 Raise awareness and build knowledge of issues around suicide; working with organisations and agencies who are involved in suicide prevention, intervention and postvention, to build an evidence base for future activity. 3 Deliver commitment and influence to suicide prevention and the National Suicide Prevention Strategy by engaging with health and wellbeing boards, Directors for Public Health and relevant stakeholders from public, private and third sector organisations, in order to drive change. 4 Mobilise action driven by shared priorities, and mobilise delivery against key actions that members believe will make a real difference to reducing suicide, and supporting people affected by suicide. 5 Share best practice by enabling stakeholders to map the actions they are currently carrying out to reduce suicide or support those affected by suicide, and share information and examples of good practice. 6 Improve support by improving accessibility and quality of relevant information, as well as sources of support for people at risk of death by suicide, those worried about a loved one and for those bereaved by suicide; making sure where possible, that families, carers and friends can play a full role in improving the accessibility and quality of information, and support for those at risk of suicide and those bereaved by suicide. We also had the opportunity to speak with Professor Louis Appleby, Chair of the Governments Advisory Group for the National Suicide Prevention Strategy for England, about how The Tomorrow project and Harmless are working within the Midlands. This was met with great enthusiasm and has prompted the ability for further collaboration. The Tomorrow Project and Harmless will look to maintain links with NSPA by working collaboratively and continuing to support the prevention of suicide both locally and throughout Nationally. East Leake Carnival? This Saturday? We’ll be there!!! The day is an important date in our calendar because it gives us a vital opportunity to raise awareness about our project in the local community, and raise some money to help keep our service going. On our stand, there will be information about our project and details about where you can get support. Remember, you don’t have to talk to us on the day. If you would prefer to talk to someone more privately, take a leaflet and contact us when you are ready. You will also be able to buy a Tomorrow Project T-shirt or have a go on our raffle ticket to win a hamper. All the money we raise will go directly towards helping us provide a confidential suicide prevention project in the local area. The Tomorrow Project in East Leake is not financially supported by external funders and we rely solely on the support given through kind donations and remarkable fundraising efforts. So please help as much as you can. 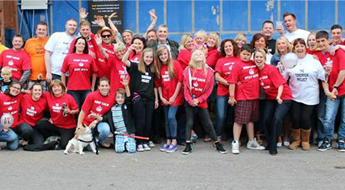 Last year we had an amazing day and the support we received was overwhelming. We hope that this year can be even more successful!!! ‘Suicide is selfish’: the things we say. Yesterday I was reading an article about a young gay man. He’d been bullied for his sexuality and then made the irreversible decision to end his life. Campaigners are using the tragedy to raise awareness about bullying and homophobia. Well I want to raise awareness about suicide, too. How can we ignore the fact that this young man’s fate was to ultimately die because of abuse and silent suffering? Comments like this are common, but they make my skin crawl. Suicide isn’t selfish- it’s desperate. When people make that decision to end their lives it is because they have hit a point in their world where it ‘feels’ as though there are no other options. Often people descend into a place where they truly believe that there would be no impact if they ended their life. Can you imagine how bad you must be feeling to believe that no one would notice if you died? Selfish doesn’t come into it, because if you truly believe you are better off dead and that no one would miss you, there’s no reason to even consider the impact on others when you are gone. For others, the pain of living is so intolerable, that they do not feel that they can stay alive in spite of how this may effect others. It’s an unbearable place to be. To label someone as selfish after their death in such tragic circumstances is the ultimate cruelty; not only had that person suffered in life to the point that they ended their life- they are taunted in death for their decisions. Yet there is a part of me that is glad of those who can still call someone selfish- their lack of understanding and compassion means that these people have never suffered in the same way. They might think they have, but they haven’t – and for that, despite their ignorance, I am glad. I would not wish that suffering upon anyone! Suicide is not selfish. It may not consider the impact on others, but that is because suicide is a desperate choice, made by desperate people at a desperate time. We don’t think clearly at these times. It also doesn’t have to be this way. If we reach someone at these times there is always the possibility of change. If we can influence that desperate state, we can change the outcome.